Season two of surveillance thriller Orwell is out next week and the developers promise it will be much darker than its predecessor. Go off the grid. Check out the best indie games on PC. Orwell: Ignorance is Strength is inspired by “the rise of fake news, social media echo chambers, and the displacement of truth.” You play as an investigative agent recently inducted to The Office, a top-secret department of the government’s Orwell security program during a time of civil unrest and a major political crisis. You are tasked with uncovering the truth behind the political tension, diving into the personal lives of those who could be potentially involved. It’s up to you whether you choose to be a guardian of truth or spinner of fake news. “Given the power to both uncover and fabricate ‘the truth’, how far will you go in the service of your country?,” the game’s Steam description reads. 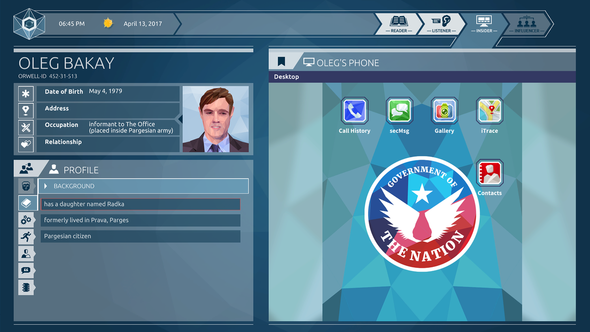 Developers Osmotic Studios also give you increased control to impact the narrative in Orwell: Ignorance is Strength You can now delve deeper into people’s personal lives and use the information gathered to alter the public’s perception of them. Season two also includes a “dynamic” time of day system that puts you in more time-sensitive, stressful situations. Orwell: Ignorance is Strength will release as a weekly episodic series, with episode one launching on February 22. The episodes will release bi-weekly with purchase of the game unlocking all three episodes. Orwell: Ignorance is Strength is available on Steam from February 22. If it passed you by, Orwell: Keeping an Eye on You is currently available on Steam for £6.99 ($9.99).